I took profits early on in Netflix (NFLX) as it failed to hold the profits from yesterday and came away with a +1.1% profit on the trade. I added an energy play to the portfolio as the sector continued its impressive performance for a second straight day. Retail numbers came in weak this morning and is jolting the market some, so I'll be cautious about adding additional long exposure here. Volatility Index (VIX) - A small move to the upside yesterday of 1.4% to settle at 15.65. All this despite the market managing to rally as well. T2108 (% of stocks trading above their 40-day moving average): Back up to 85% which is right at its multi-year highs. Moving averages (SPX): SPX held the 200-day moving average for a second straight day. Technology slowed down a bit yesterday, while Energy continued its surge higher and should now be considered in play for additional gains to the long side. Industrials also continues to hold up well. Utilities has been a solid play all year long so far, but I like it more as a longer term position than as a swing trade. A very poor retail number that came in well below expectations has the market retreating today. We haven't seen any panic selling over the past month, and none last week either, to be more specific. 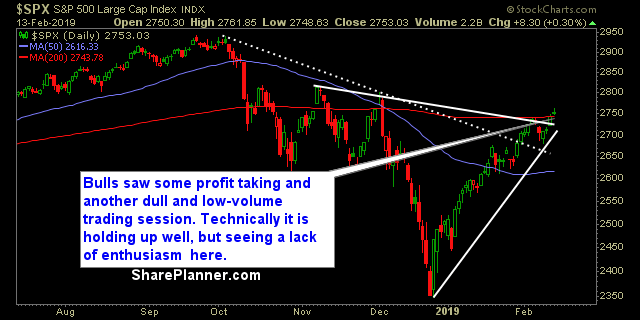 Watch how the market behaves at the 200-day moving average as well as the 5-day MA for possible areas for a dip buy.